Several of our customers have called with questions about a mailing they received from Sage Payment Solutions. 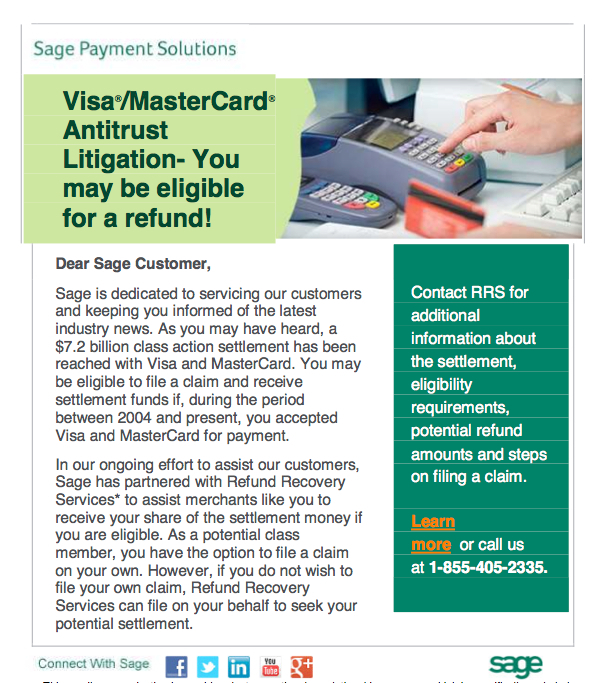 The title of the mailing “Visa/Mastercard Antitrust Litigation – You may be eligible for a refund!” announces that Visa and Mastercard users may be eligible to claim part of a $7.2 billion class action settlement concerning swipe fees. Visa, MasterCard and the nation’s biggest banks have agreed to pay $7.3 billion to millions of merchants to end a seven-year dispute over credit card “swipe” fees. The settlement includes at least $6.05 billion in payments to some 7 million merchants for past damages and a temporary reduction in fees valued at $1.2 billion. 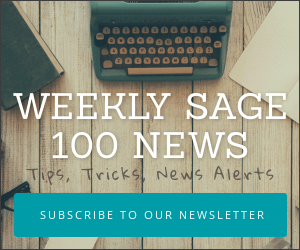 The mailing from Sage is a way for users who don’t wish to file their own claim (here) to use the services of a third party who will file the claim on their behalf for a percentage of the amount recovered.